“It is a truth universally acknowledged, that a single man in possession of a good fortune, must be in want of a wife” – Jane Austen. 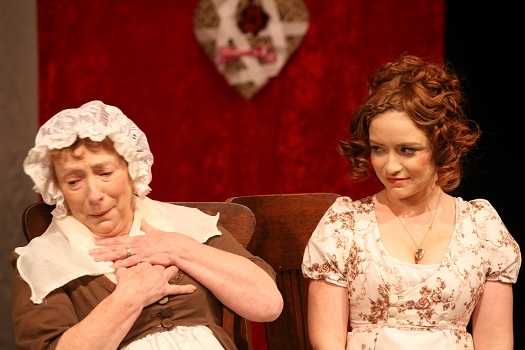 There is a fresh revival of Jane Austen’s 1813 novel PRIDE AND PREJUDICE, as adapted by Deb Mulhall, currently playing at the Star of the Sea Theatre, Manly. Experience the magic of following the machinations of Mr and Mrs Bennet’s (Ross Scott and Jennnie Dibley) five unmarried daughters (with Rhianne Evelyn-Ross, Orlena Steele-Prior, AmyLea Griffin) as the women are besotted by the two rich, eligible but status-conscious friends, Mr Bingley (Daniel Csutkai) and Mr Darcy (Andrew Steel). The characters succumb in many ways to pride and prejudice. 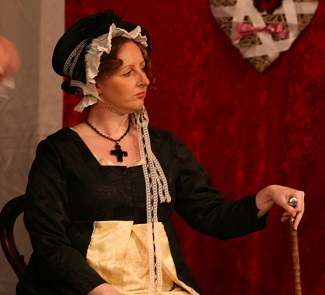 Fourteen actors vividly create the experience of living in 19th century England, detailing the pride which would keep lovers apart, simply because of all the prejudices of the upper classes. The director of PRIDE AND PREJUDICE successfully found wonderful Sydney-based actors, able to bring each of Jane Austen’s characters alive with charm, charisma, and wit. 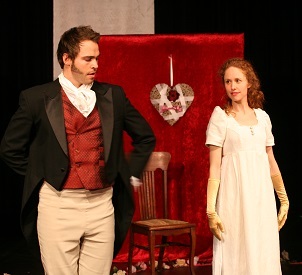 The play does focus on class and money, and includes all of Jane Austen’s wry, incisive humour. This superlative and deeply satisfying adaptation, comically exaggerates the characters of Mrs. Bennet, Miss Bingley and Mr. Collins, and with Mrs. Bennet on the verge of hysteria. Especially memorable is James Belfrage’s portrayal of the obsequious Mr. Collins. Orlena Steele-Prior stunningly portrays Lizzie, showing her to be thoughtful, witty, ironic, passionate and tender. Andrew Steel as Darcy has perfectly captured all at once, the complexity of the character, showing his aristocratic refinedness, his shyness and sense of decorum, his disdain, and his underlying passions. 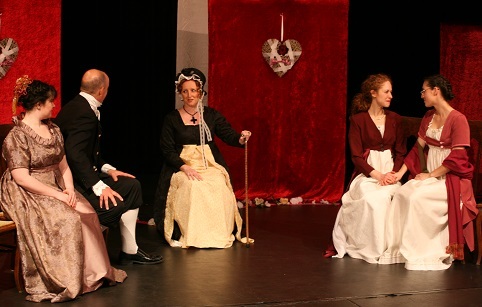 Highly recommended, the Factory Space Theatre Independent Company’s production of PRIDE AND PREJUDICE plays at The Star of the Sea Theatre, Junction of Collingwood and Iluka Streets, Manly, NSW, until Saturday 27th July 2013. It is a brave writer who adapts one of the world’s most beloved novels. And a brave director and cast who get together to bring it to life. This new Manly version is loads of fun. Lively. Amusing. Full of gallantry, scheming, witty tête-à-têtes, brooding and frippery. And it really hits home: the audience audibly gasp at those famed utterances that must be uttered, like Charlotte’s pithy & pivotal comment that she doesn’t seek happiness, simply comfort and her own home. 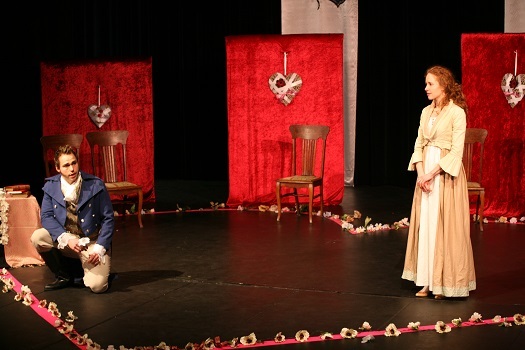 It’s a never-a-dull-moment romp with the action taking place in a heart-shaped and flower-strewn arena of love. Roses symbolise the promise of love and perhaps the real possibility that love may well be rejected, crushed and cast aside. The young ladies in their magnificent gowns glide in and out rather like creatures restricted to a small cage; while interplay of music and dance reflect the social nuances of the time and the rising passions of the young ladies and their beaux. Bravo to the actors for making the roles their own – a well-cast production! It goes without saying that it’s a hard act to follow Larry Olivier et al. But this Darcy is played with admirable restraint and we respond - from loathing him to feeling for him as he struggles with his emotions, his growing affection for Elizabeth, and his ‘Pride-with-a-capital-P’. A role handled with nuance and real class. Elizabeth and Jane’s sisterly affection is clear. Jane’s descent from radiance to deep sadness when she believes Bingley has lost all interest in her is moving; Lizzie’s shift from brash self-assurance to feeling completely out of her depth when she realises she has been plain wrong about Mr Darcy gives us the satisfaction of seeing the ‘Prejudice’ of the title in full bloom. Mrs Bennett is a hoot as the fluffy-headed woman who worships the state of matrimony that she so badly wants for her daughters. Mr Bennett is just right as the put-upon good-hearted husband who has learnt over many years to tolerate his wife’s appalling – but terribly comical - lack of decorum. Mr Collins is instantly fawning, ridiculous and fun; Colonel Fitzwilliam is the loyal and attentive friend. Charlotte is elegantly cool and clever; while the composite ‘young lady’ is the sensible one who doesn’t mind a zot that she seems to be missing out on all the fun. Bingley is exactly as he should be – dashing, courteous and so struck by Jane that he literally can’t take his eyes off her. His accomplished housekeeper sister Caroline, a rather determined femme fatale, just can’t get her claws into that elusive Mr Darcy – is she the true ‘villainess’ of the piece?